The Best Pig blogs from thousands of top Pig blogs in our index using search and social metrics. Data will be refreshed once a week. Sheffield About Blog All the latest pig industry news, including pig diseases, health and welfare information, nutrition and much more. Facebook fans 2,966. Twitter followers 3,645. West Lafayette, Indiana About Blog The global leader in providing pedigree services, marketing platforms and educational resources that support members in promoting and merchandising documented swine genetics. Its mission is Enhance the value of pedigreed swine, maintain breed integrity, and provide relevant member education and youth development experiences. Facebook fans 12,271. Twitter followers 3,033. Minneapolis, MN About Blog The business magazine of the pork industry, National Hog Farmer provides professional pork producers with breaking news, business management guidance, and timely production information needed to keep modern pork pork production systems competitive. Facebook fans 5,902. Twitter followers 5,437. 5. Bacon Today | All about the World of Bacon. About Blog Daily News on the World of Sweet, Sweet Bacon! We have dedicated this blog to all things bacon and things related to bacon. We bring you awesome products, recipes, articles, blogs, and pure fun. Facebook fans 64,644. Twitter followers n/a. About Blog Site about the pig production chain aimed at veterinarians, farmers, etc. Articles by swine specialists on health, husbandry, etc. Facebook fans n/a. Twitter followers 1,905. Lenexa, KS About Blog PORK Network is the pork industry’s business leader, delivering a wealth of information to pork producers and their partners. It covers late-breaking news, business information and issues that are significant to those involved in all aspects of the pork industry. Facebook fans 10,470. Twitter followers 5,482. About Blog Pig World is the official magazine of the National Pig Association and provides pig industry news. About Blog This is a subreddit for anyone who loves pigs or has pet pigs. Facebook fans 1,092,373. Twitter followers 475,877. Stoneleigh, Warwickshire About Blog AHDB Pork provides practical on-farm advice, training and market information to help English pig farming businesses. Facebook fans n/a. Twitter followers 2,306. Des Moines, Iowa About Blog The National Pork Board will elevate U.S. pork as the global protein of choice by continuously and collaboratively working to do what’s right for people, pigs and the planet. The National Pork Board is the catalyst that unites pork producers with key stakeholders focused on building a bright future for the pork industry through research, promotion and education. Facebook fans 4,412. Twitter followers 7,265. USA About Blog This blog is dedicated to educating whomever is interested in learning about pigs. Follow our blog that will feature to help you beacome the best pig parents you can be..Our mission is to provide accurate and factual information to others in the pig community. Facebook fans 28,368. Twitter followers 2,152. Facebook fans 11,818. Twitter followers 3,911. About Blog American Mini Pig Association is comprised of reputable owners, breeders, rescues advocates, and vets to set a standard and education in the mini pig world. Facebook fans 18,394. Twitter followers 53. Washington, DC About Blog The Global Voice of the U.S. Pork Industry. NPPC’s mission is to fight for reasonable legislation and regulations, develop revenue and market opportunities and protect the livelihoods of America’s 60,000 pork producers. Facebook fans 55,670. Twitter followers 9,465. About Blog Arbuckle Farm is located in Southern Michigan and show pigs are our specialty. Our record speaks for itself! About Blog The Iowa Pork Producers Association is an industry-inclusive organization whose mission is to provide a unified voice to promote and educate for a sustainable, socially responsible, profitable and globally competitive pork industry. Facebook fans 14,772. Twitter followers 4. USA About Blog The official blog for Bacon Scouts, the world's leading bacon review and bacon delivery service. Facebook fans 496. Twitter followers 185. Lincoln, NE About Blog Nebraska Pork is a non profit organization established in 1961--was developed to promote the pork industry through the enhancement of consumer demand, producer education and research. NPPA's mission is about communicating opportunities and encouraging profitability and sustainability for Nebraska's pork producers. Facebook fans 4,070. Twitter followers 2,805. About Blog your online connection for jobs in the swine industry. Here you will find a wide variety of swine jobs available throughout North America and Worldwide! Its mission is to promote careers in the Pork Industry, and to provide a focused and concise website specific to those looking for Careers in the Pork Industry. Facebook fans 2,829. Twitter followers 5,323. About Blog Swineweb.com is the only North American Pork Industry website highlighting complete Swine information daily: Commentaries, News, Technical Information, Market Information, Streaming Web casts, Regional coverage per state, Videos, and the famous Jim Long Pork Commentary. Facebook fans 5,740. Twitter followers 9,745. Truro, Nova Scotia About Blog The pork industry in Nova Scotia is a family business that plays an integral role in the province’s employment and economical development. Pork Nova Scotia is the marketing agent for hogs in Nova Scotia. Facebook fans 851. Twitter followers 185. Western Canada About Blog Love pork? Share your passion. We scout the latest news, recipes and trends from Alberta and B.C. pork lovers like you. Facebook fans 749. Twitter followers 1,421. South England About Blog Find hog recipes, pork and bacon products. The Jolly Hog's mission is to sell quality pork products to as many people as possible across the land. Facebook fans 2,483. Twitter followers 3,835. About Blog At the North Carolina Pork Council, our mission is to promote and educate to ensure a socially responsible and profitable North Carolina pork industry. Facebook fans 4,763. Twitter followers 1,803. About Blog A national newspaper dedicated to the pork industry. The latest Australian pork industry news published monthly with reports on a variety of topics of interest to pork producers and associated industries. About Blog keep calm and love piggies! all of the pics I post here are not mine unless I say so. 🙂 enjoy! Eustis, Florida USA About Blog A fun and helpful resource forinformation, gifts and supplies mini pigs, pet owners of pot bellied pigs. Facebook fans 1,051. Twitter followers 37. About Blog Ontario Pork represents the 1,369 farmers who make it their job to provide consumers with delicious, nutritious, safe, high quality pork. Look for and ask for Ontario pork in your grocery store or butcher shop. Facebook fans 1,389. Twitter followers n/a. About Blog This blog is to give our customers a birds eye view of what we are doing, how we raise our pigs, as well as how we sell them. It will keep customers up to date with when we are selling our pork and other products as they come on board. About Blog Miller Premium Pork is a family owned and operated pork farm in Southeast Iowa. Taste & quality are the ONLY two things that matter. It’s our mission to bring the most tender, all natural, highest quality pork from our farm to your table. Facebook fans 312. Twitter followers n/a. About Blog Adventures with pigs of all sizes on Tumblr. Hereford. UK About Blog North American Pet Pig Association - Pigs As Pets, Pig Education, Care of Pigs, Preserving Pigs, Protecting Pigs, Pet Pigs. The mission of North American pet pig Association is to preserve and protect the pet pig as a pet, promote the proper care of pet pigs, and inform pet pig owners as well as the general public about pet pigs all through education and other lawful means. Facebook fans 433. Twitter followers 21. Canberra About Blog The producer owned organisation supporting & promoting the Australian Pork Industry. Australian Pork Limited (APL) was formally registered as a company on 23 May 2000 following extensive industry consultation and the overwhelming support of Australian pork producers. Bedfordshire UK About Blog Petpiggies has years of experience breeding happy, healthy, pet micro pigs with great temperaments. We are proud to have earned a reputation for honesty and openness and for maintaining the highest levels of welfare for our little pigs with the support of specialist veterinarians and nutritionists. Facebook fans 44,736. Twitter followers 4,035. About Blog Come meet Oscar and watch as we adjust to life with a pet mini pig. This blog is full of experienced pig parents who are a wealth of information and can provide quick responses to many questions for both potential and current mini pig owners. Facebook fans 2,381. Twitter followers 246. Marmande, France About Blog Thyme for Cooking, Blog It's about the food and life in France. Blog post covers Pork, BBQ Grill products and recipes by Katie Zeller. Facebook fans 3,029. Twitter followers 9,453. About Blog We promote Free Range Pig Farming in South Africa and help small family farmers to raise pigs outside in a way that allows the pigs to express their natural instinctive behaviours. We do this by setting standards for the Free-Range Pork Industry to secure the best tasting and mouth-watering pork for the caring and discerning consumer. Ames, Iowa About Blog PigCHAMP provides industry-leading swine production software to farms and businesses world wide. In our blog, we will learn more about PigCHAMP, its staff and and global partners, and celebrate the pork production industry. Facebook fans 108. Twitter followers 339. About Blog The Missouri Pork Association represents Missouri's pig farmers, while promoting all things pork. Its mission is to enhance and optimize opportunities while eliminating or minimizing barriers for the success of Missouri pork producers and other industry stakeholders. Facebook fans 362. Twitter followers n/a. Front Royal, Virginia About Blog Welcome To The Mountain Kitchen. my name is Debbie and I want to share my dishes, pork recipes with others. Facebook fans 955. Twitter followers 1,296. Facebook fans 56,236. Twitter followers 11,948. About Blog The story of the Atherton family's attempt at self-sufficiency. Facebook fans 1,744. Twitter followers 19. About Blog Positive reinforcement, the science of learning & musings on life with pigs. Facebook fans 900. Twitter followers n/a. 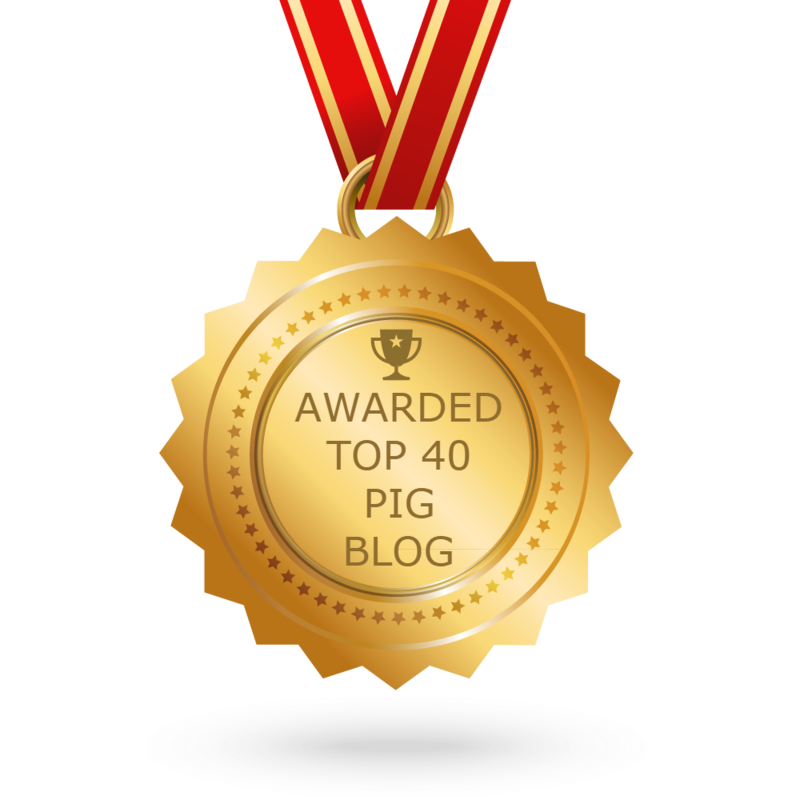 CONGRATULATIONS to every blogger that has made this Top Pig Blogs list! This is the most comprehensive list of best Pig blogs on the internet and I’m honoured to have you as part of this! I personally give you a high-five and want to thank you for your contribution to this world.